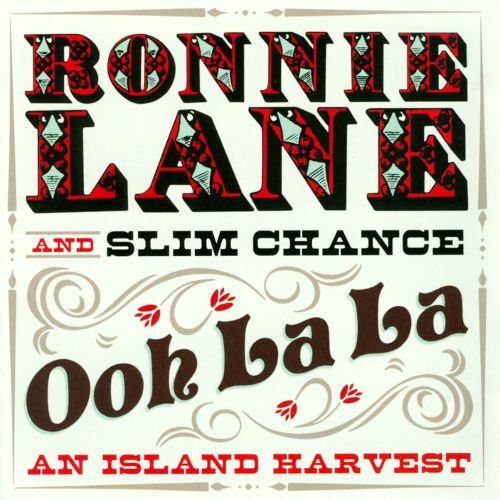 The perfect soundtrack to a resplendent Fall day, Ooh La La: An Island Harvest from the late Ronnie Lane and his ironically named early-1970s group Slim Chance is today’s rock room soundtrack. Lane, founder of both the Small Faces and its follow-up group the Faces, penned or helped pen many of the most recognizable musical compositions of the 1960s and 1970s. In addition to his wonderfully melodic bass playing, Lane was a master of melody and colorful lyrical content. His later work with Slim Chance, however, was the rustic antithesis of his massive excursions with the Small Faces and Faces. While always retaining the ability to create pop melodies, Lane’s music slipped into worn working clothes, tossing away the glitz and glamour of his prior band's world popularity. Of course, to this point Lane seemed destined to play a supporting musical role throughout his career, first to rock dynamo Steve Marriott, then to future Faces lead-man Rod Stewart. He often moved stealthily out of the spotlight, even as Lane’s other bandmates relished in it. The entire time, Lane would sit comfortably in the shadows writing classic songs, creating music on his terms and eschewing conventional commercial ideals. After leaving the Faces in June of 1973, Lane purchased a sprawling farm in the English hills, and built his own mobile studio in order to create at home and also to follow his traveling musical circus, “The Passing Show.” Both of these decisions would eventually put Lane into debt, but they never dampened his incredible sense of adventure and his ability to elicit emotion through song. Lane turned away from the rock stardom that he was never entirely at ease with, and in the process conceived a rustic and woody music rooted in honesty, simplicity and expression. Lane’s journey saw him mature from a kinetic mod to a musical farmer, and eventually into a folk-tale weaver. 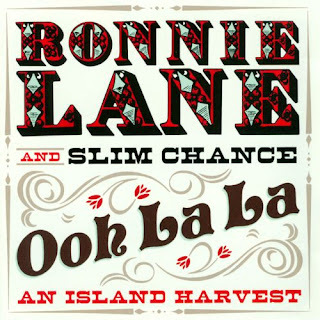 The Ooh La La: An Island Harvest anthology, which comes in the form a two-disc set, compiles the best of Lane’s post-Faces solo work with Slim Chance. 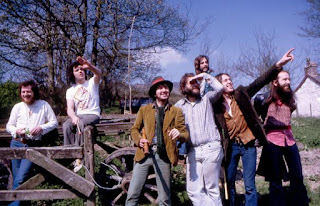 The set collects highlights from Lane’s two Island Records releases, Ronnie Lane’s Slim Chance and One for the Road, in addition to a wealth of unreleased tracks and a prodigious concert appearance for BBC In Concert from April 23, 1974. Disc one begins with a resounding version of Lane’s “Ooh La La” which, drizzled with mandolins and horns, makes for a refreshing update of a well-known classic. The beautiful, largely forgotten composition “One for the Road” makes you wonder how the song was not Lane’s greatest achievement. His airy arrangement reflects a rediscovered country spirit, his comforting rocking-chair voice the ultimate bucolic refection. The running order of the set does not reflect any chronology, but nonetheless gives the listener an organic pitchfork full of Lane’s finest creations. The delicate flight of “Harvest Home” is a highlight of disc one, a cinematic melody that sways on brittle prairie breezes and the rich thick scent of tilled earth. The instrumental resonance of the tune quakes with woody acoustics, tout strings and naturally created dynamics. There is an unpretentious musical attitude that pervades the collection and a true celebratory vibe that permeates the music. The second half of the collection begins with an alternate take of what should have been Lane’s defining moment as a solo artist with, “The Poacher.”Striding acoustic guitar and swelling strings levitate the song to mystical levels. Lane’s diverse musicality is again on display, starting with the island groove of “Street Gang” and followed by the stony minstrel display of “Nobody’s Listenin'” and “Stone.” “G’morning” epitomizes the wealth of melodic riches sprouting from this collection, which highlights an involved and positive group collaboration. The 1974 b-side “Lovely” is an added bonus to the set, as its whistles, hand claps and rough-hewn vocals recall a vaudeville country jamboree. The main course of the second disc is the complete BBC in Concert appearance. A perfect cornucopia of Lane’s Faces era compositions nestled nicely next to his blossoming solo pieces. The earliest lineup of Slim Chance wheezes its way through honky-tonk versions of “Last Orders Please” and “Flags and Banners,” as well as delicately navigating the melodic intricacies of “Done This One Before,” and “Tell Everyone.” Every song is a picturesque expression of the power of song, each player and instrument adding shade or detail into the final image. “Tell Everyone” elicits such understated power and grace that it’s difficult to not become emotionally invested. The final magical result of these performed pieces is a complete respect for the muse by the musicians — and true love for the art of the music. Ooh La La: An Island Harvest is a must-have addition to any rock aficionado’s collection, as Ronnie Lane’s contributions to rock, folk, singer songwriter and even British folk and vaudeville music are unparalleled. His refusal to conform to rock business standards were probably his only fault, but the results contain some of the most honest and salt-of-the-earth melodic creations you will hear in the canon of rock. Ooh La La: An Island Harvest finally compiles the music that may have not found a home on the hit parade, but will always have a home in the hearts of those who listen.